One couple confessed they witnessed more whales from the back porch than on a whale sightseeing excursion where they saw none. Perched atop a cliff overlooking the Pacific Ocean, this plantation-style estate is one of those rare places where you ‘d swear that those dolphins piroetting in front of you are doing it on cue. Each of the eight suites is exceptionally large, lavished with European and Asian artifacts and Italian marble bathrooms. Rooms feature king beds, jacuzzi tubs, fireplaces, and a lanai to savor the sunset. 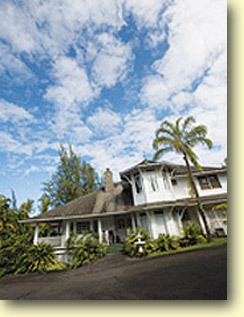 Owned and operated by John and Michele Gamble who live on the property, this bed-and-breakfast inn layers touches of old Hawaii with an authentic Hawaiian tea on Saturdays, antique photos of island monarchs, and kihili feather stands (handcrafted by Michele) that signify royalty and honor. Breakfast changes daily but always includes local bounty. Banana pancakes, coconut carrot muffins, or guava juice anyone? Details: $250 to $440; 866/963 6076 .